That message arrived in my inbox from a very nice chap who I’d enjoyed chatting to at the recent Triskele Literary Festival in London. The advice that I sent him in reply will help any writer thinking of becoming a self-publishing author, so I thought I’d put it on my blog to help as many people as I can. 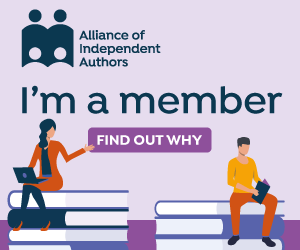 First of all, you should most definitely join the Alliance of Independent Authors (ALLi) via this link, because you’ll find it an invaluable resource at all stages of your self-publishing journey, in lots of different ways, e.g. The benefits are incredibly good value for money, and if any aspiring indie author can afford to pay for only one thing, that’s the one thing I’d recommend. You should soon realise what tasks you can and can’t manage yourself, and you should delegate those to someone else who can. You should ALWAYS get your proofreading done, at the very least, and preferably some editing too if you can afford it, and next on your shopping list should be a good cover design from a book design specialist. That will be sufficient to get you started by publishing to Amazon in print and ebook form, and once you’ve mastered that you can move on to the various other distribution platforms. If you want to be able to sell your books via bookshops, you should also publish via Ingram Spark. (NB This doesn’t guarantee that your book will be sold in any bookshops, but it makes it possible for bookshops to order them if they want to. Thirdly, it depends on whether you are cash-rich, time-poor or cash-poor, time-rich. If money is no object, you can pay a company to publish a book for you, who will do everything other than write it, to get it to the production stage – but you will have to market it. Buyer beware – there are LOTS of charlatans out there, but the good news is that ALLi will help you identify the good guys! Also, of course, if you delegate to a third party, you relinquish some degree of control. Our guide Choosing a Self-publishing Service (free to download if you become a member) is available to buy in paperback here). It’s also worth joining a good local meetup group of self-publishing authors, if you can find one near you. I run two, in Bristol and Cheltenham, and I’m also involved with one in Oxford, and know of others in London and elsewhere. If you’d like me to put you in touch with any of my self-publishing author friends near where you live, leave a comment and I’ll see if I can hook you up with a group or a like-minded individual. Make sure your book is the best it can be before you publish it – it is so easy to self-publish a book these days that it is too tempting to push the “Publish” button sooner than you should! I’ve now self-published a number of fiction and non-fiction books, and I’m also currently writing the second in a cosy mystery series of seven, the Sophie Sayers Village Mystery Collection. To join my mailing list so that I can let you know whenever I’m launching a new book, or other book-related news, just click here – and you’ll get a free ebook as a welcome gift! I would love to meet up with any other self-publishing writers – I live in Winchester, but can get to London easily.